Government / National Lab Affiliates are represented by a Affiliate Liaison selected from applicants nominated from within the affiliate. Affiliates are also urged to appoint an Associate Liaison to strengthen the connection to NISS. Joint research projects facilitated on-site at NISS or at the Affiliate institution. Assignment of NISS-Affiliate postdoctoral fellows with NISS mentorship. Formation of expert panels to focus on special topics. Tailored short courses that target government / national lab needs. Mentoring of junior government data scientists in special areas. Access to a rich set of colleagues in the statistics / data science fields to connect and network with from industry, government / national labs and academia. Special topics, designed for / by Government, National Lab and Industry Affiliates. Government / National Lab Affiliates propose and prioritize topics for annual Special Topics workshops. Workshops organized by NISS on topics in Data Science for Leadership from Government / National Lab Affiliates. Networking with leading academic and industry statisticians. 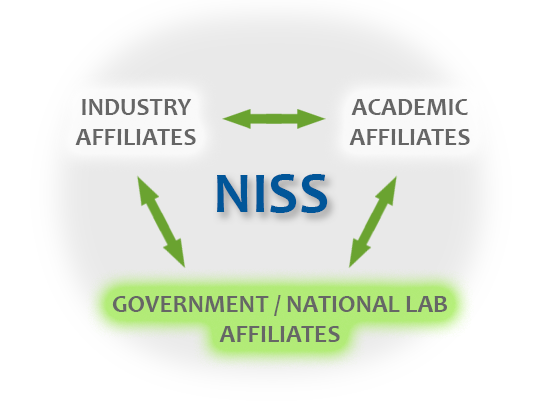 NISS Government / National Lab Affiliates membership fees from $10,000 per year.